To expedite justice delivery in cases of heinous crimes and those against women, children and the elderly, the government has earmarked over Rs.4,100 crore to set up 1,800 fast track courts, one of the largest allocation of funds so far to set up such special courts. These funds will be available to states till 2020. Fast-track courts were constituted for the first time in 2000 for a period of five years with an allocation of Rs.500 crore. The scheme was extended by another five years, and again till 2011, with an additional allocation of Rs.509 crore. According to the law ministry , at least 1,700 fast-track courts were set up by states during the first two phases. The highest amount of money was allocated to Uttar Pradesh, followed by Maharashtra, Gujarat and Bihar. These four states together account for Rs.1,695 crore, or over 40% of the total allocation. Though the government had discontinued funding for fast-track courts after 2011, some states continued with such courts. The recent allocations are based on the recommendation of the 14th Finance Commission which had endorsed the Central government's proposal. The government had proposed to set up 1,800 fast track courts in different states to help bring down pendency of cases. 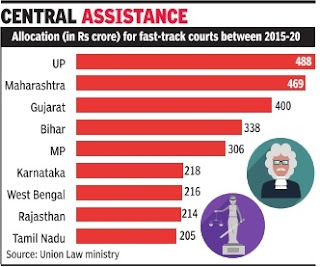 Uttar Pradesh, which was granted Rs.488 crore to set up fast track courts, accounts for the largest pendency of cases in subordinate courts as well as among high courts (Allahabad HC).